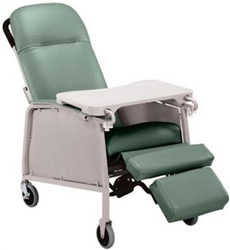 3-positions for recline: upright, deep recline and elevated foot/leg rest. Neutral color and durable fabric that resists soiling. Neturalal color and durable fabric that resists soiling. 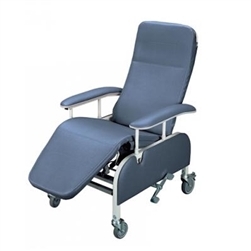 3-way reclining wheelchair - Articulating headrest. Webbing on cushions to prevent sliding. Unique self-adjusting suspension virtually eliminates risk of "bottoming out". Quick release upholstery for easy cleaning, removal and replacements. 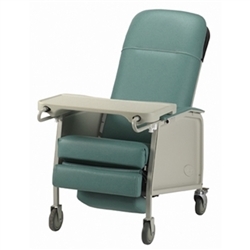 4 way recline offers the ultimate in flexibility. Easy to activate drop-arm mechanism facilitates lateral transfers. 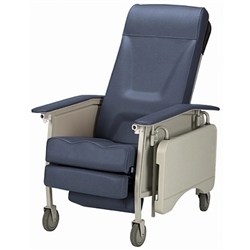 With weight capacities in excess of 250 pounds, Geri Chairs are durable and designed to improve quality of life. 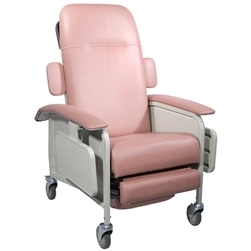 These chairs provide seat support in a moveable comfortable chair.